"Curse of the Pharaoh was last night. It went sooooooooooooo well that I would just like to thank you for doing an amazing job. Thank you! I thought it was perfect. Absolutely amazing. Me and my friends had the best time, with relatively no work on my part. Four months later and my friends are STILL talking about it. It let us get really creative, and yet we all saw a competitive side of our friends that we hadn't seen before." "We ended up having over twenty guests invited and only two bowed out at the last moment because of family illness. At first I was terrified, no one mingled – they tried to stay in their private groups. As the Servant I began prodding them into asking questions of other guests and directing them toward a 'treasure' table we'd set up. By the end of the evening everyone was having a blast and wanting to know when we would host the next one.'" "Just a quick note to say thanks for helping our New Years Eve go so well! We played Curse of the Pharaoh and everyone had a fantastic time. I was surprised that the cost was the same as purchasing a 'kit' from the shops but the money-back guarantee (and the quality of the introduction doc) won me over!" "We had a great group, and it was a terrific time. For a group where only one of the participants besides myself had every heard of roleplaying, they did a super job at getting into character... Thanks for the wonderful game [Curse of the Pharaoh]!" "We had the Curse of the Pharaoh a few weeks ago and had such fun! Thank you for a very inventive and clever game." "I played Curse of the Pharaoh at my friend's birthday party. I had a great time. My friend made traditional Egyptian cuisine and all the costumes looked great. I was very impressed with the quality of freeform games, and now I know what to do for my birthday party!" "First time we played a Freeform Games game, and Curse of the Pharaoh Expanded was totally enjoyable. We had played another Murder Mystery game, but it was nowhere as good as this. Well done – the setting and characters were brilliant. The plots were intricate to the right point, and the fact that the players have their individual objectives rather than just focusing on the main murder is a great touch." "Curse of the Pharaoh was a great game. Was fun to watch the guests dress up, and take to character. Though they were slow on the uptake (lots of reading for 16yos), they quickly came around and had a blast. After the game, they sat for over an hour, talking about their characters' successes and failures." "I enjoyed Curse of the Pharaoh very much, and must say congrats to you for creating a great storyline." "I've never had an activity at any party that got everyone talking to each other quite as quickly as Curse of the Pharaoh did!" "Well, actually I'm about two years late in reporting on this murder mystery but it was excellent (the best one so far our guests reported!) We used the garden mostly for Curse of the Pharaoh and it was a great success – we bought around seven sand-bags and emptied it all onto sheets in the garden – placed half a gazebo/tent over the sand and added the props table and hid scorpions etc in the sand! It was fantastic! This was our fifth murder mystery and we all thoroughly enjoyed it!" "It sounded like Curse of the Pharaoh would be a lot of fun – and it was. EVERYBODY LOVED IT, and everybody wants to play more Freeform games." "We did Curse of the Pharaoh Expanded for my birthday and had a blast! I was so impressed with the game, the flow and of course everyone's costumes. Super fun!" Curse of the Pharaoh is a dinner party murder mystery game for 6 to 19 guests and a host – download the free introductory pdf file. This game is a bit more complex than some of our others. If you've not hosted one of our games before,you might want to allocate a bit longer to prepare for it and to read through how it's going to work. Join us in Egypt, 1894, and determine the fate of the British Empire in a thrilling evening of mystery and murder. You will be in the middle of the action and it will be up to you to wheel and deal with the other guests. Can you achieve your goals, keep your secrets hidden and survive Curse of the Pharaoh? It's up to you. The Valley of the Kings, Luxor, Egypt. 23 April 1894. The excavation season will soon be over, as the baking sun makes digging unbearable, but the Oxford University archaeologists lead by Sir William Saville have made a startling discovery. Tonight, the team and their guests prepare to enjoy a slap-up dinner to celebrate the uncovering of the tomb of a previously unknown XVIth Dynasty pharaoh. But while the archaeologists make merry, dark clouds gather, internal tensions among the group burst to the surface and one of the local diggers is brutally murdered. Curse of the Pharaoh lasts for about four hours and is suited to an evening. It is often played over a meal – a finger buffet if possible to allow guests to circulate and talk in private. 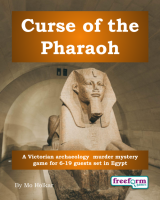 "Curse of the Pharaoh Expanded is a brilliant game – better than any other murder mystery I have played." The free introductory pdf file contains an introduction to the game, a cast list of all the characters, and a copy of the Cairo Gazette – plus details of how to buy the game. You can buy a German translation of this game – click here for more details. Curse of the Pharaoh is unlike many murder mystery games. Although the game starts with a murder, most of the characters have more important things to do than to investigate it. And the killing may not be over – it is unlikely that everyone will survive the remainder of the evening! Curse of the Pharaoh is played just like a murder mystery game. You may be trying to solve the murder, but primarily you are (initially at least) concentrating on your own goals and objectives. Unlike most boxed murder mystery games, Curse of the Pharaoh lets you decide how to achieve your goals and thwart your enemies. "Curse of the Pharaoh Expanded has a brilliant story – I have played other mystery games from other sites in the past – your story was unique and everyone loved the complexity and the props." On the evening of the game the guests are met by the organizer, the archaeological team's native servant. They then receive their detailed backgrounds - including dark secrets, objectives and money. When everyone has arrived the servant announces that, with the corpse tidied away into the camel shed for safekeeping, dinner will now be served. The fun then begins as everyone questions, bribes and blackmails each other. As the evening progresses they may even try to murder one another! Depending on what the players choose to do, there are several different possible endings, but finally everyone finds out how they did, and what secrets everyone else was concealing. Curse of the Pharaoh costs £20.00 (GB pounds) or US $29.99. You can buy it in either currency, from anywhere in the world, as you prefer. The price will be converted back into your own currency for you, at today's exchange rate. We offer a Cast Iron Guarantee on all our murder mystery games. If you're not completely satisfied with Curse of the Pharaoh then please let us know within 30 days and we will refund you. See our full terms and conditions here.